Ever seen a Chemex coffee maker? It’s a lovely thing. Looks like an hourglass made from scientific glassware. It’s in the collection of the Museum of Modern Art, even. Ever wonder how the person who designed that would have designed a car? No? Well, too bad. Because he did, and here it is. ... which would make for a fascinating guiding tenet of some sort of HVAC cult. As a chemist and physicist I am challenged by the present design of our automobiles. Even the denomination of this machine invites criticism: auto-mobile means self-moving. Actually. the car is moving due to the oxidation of hydrocarbons; moving by chemical reaction. How about naming it CHEMOBILE? Now, the design. There is a strange uniformity of design among the mass-produced cars of the nation. They practically look all alike. In all large companies decisions are arrived at by committees ... In my own proposal I have retained all basic elements of automotive engineering. I propose a new design, which is rather analogous to a man riding a horse, or to a Maharajah riding in a basket on top of an elephant. In contrast to the trend of aping airplane design, with space at a premium and with a nervous “Fasten your safety belts” atmosphere, I propose a roomy, livable YACHT ON WHEELS, with surplus space available for parcels, umbrella, bottles, tos, brushes, writing pads, make-up, soap, towels, ice, water boiler and, of course, a CHEMEX coffeemaker. The CHEMOBILE design allows for this surplus space by exploiting the entire wheelbase as living space. Here are the outstanding new features: I) The motor is arranged between the front-and tear-axles, as low as road clearance will allow. 2) The passenger space is arranged above the space for the motor. He’s hitting on many of the design ideas I personally find so compelling: maximization of interior space for the driver and passengers, a small exterior and a big interior, cab-over-engine design, this guy somehow knew what I’d like. The result is, to most people’s eyes, though, pretty comical. Essentially, what he’s designed here is a ‘50s era American Kei van, or, maybe more accurately, a Toyota Previa, just scaled up to match the time and era. It absolutely maximizes the interior space of the car, because the engine is mid-mounted, underfloor, leaving the entire length of the car free for people and stuff. It’s an idea that’s been explored by cars like the Stout Scarab, and in what may be the best known realization of this general concept, the VW Microbus. He describes wanting a “YACHT ON WHEELS” and the ovoid-plan passenger cabin certainly could provide that. The strange rectangular fenders start to make sense when you consider that he was likely trying to keep wheel wells from impinging on the interior space; hence the ovoid passenger compartment with what are essentially external wheels. The rectangular protrusions are also useful to house the cooling system and radiator up front, and the fuel tank at the rear. He didn’t specify this specifically, but based on the drawings, I think that would make sense. Plus, there seems to be a fuel filler on the left rear fender. He could have gone full-cube, but I suppose there are aerodynamic benefits to having a shape more suited to cut through the wind than a storage shed, and the corner space gained by a cube probably wouldn’t be the most used space, anyway. This would have been the ideal application for a boxer engine of some kind. If this thing had actually been produced by the early ‘60s, a Corvair flat-6 could have been the ideal powerplant. Yes, this thing looks bonkers, especially with that crazy porthole grille up front and, well, the whole damn thing. But I genuinely like this coffeemaker’s fever dream-car. It hits all my space-utilization fetishes perfectly, and you do see this sort of design actually appear every now and then, most commonly in very futuristic Japanese concept-car designs. I actually think a design like this has real potential in the future, especially for an autonomous vehicle. If you’re not needed to drive, all the other interior aspects become much more important, and a large, flexible enclosed space like this would be a lot more appealing than a traditional low-roof sedan. 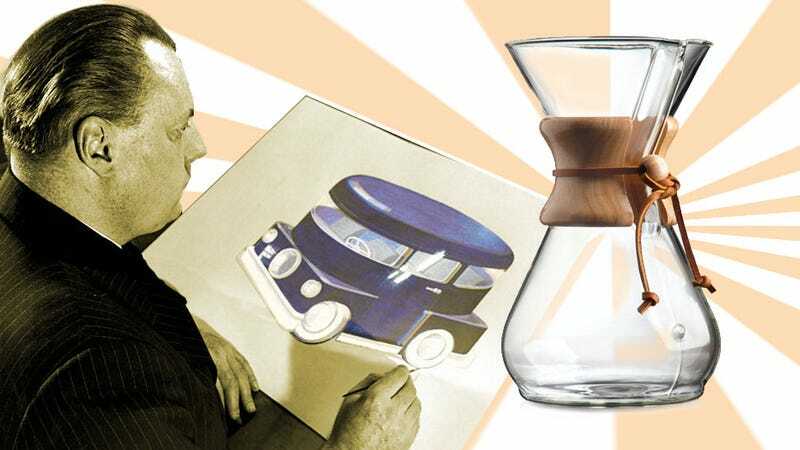 So, sure, at first glance you may think that there’s a damn good reason coffeemaker designers obsessed with the philosophical value of refrigeration don’t design cars, but, after giving it some thought, maybe this vacuum-obsessed chemist was on to something.